those last two photos definitely could pass for natural light! First of, *love* birthday weeks! My birthday is on a Friday, so I don't think that I will be so lucky. Yes, the last two could definitely pass for natural light! You nailed the photos in the restaurant - I always struggle with lighting in dimly lit places, but you captured it perfectly! Wow, definitely starting to see the F&W look. Very nice. Glad your "birthweek" went pretty well; see, getting "old" needn't be bad! And a speedlite definitely qualifies as "available light." You did good. Your restaurant photos are always so charming. The last two do indeed almost look like natural light! Do you use flash for night shots? i'm really enjoyed the birthday-related posts. SO lovely! I love your restaurant photos! Everything always looks so delicious! And those could totally pass for natural light! i need friends who will take me out to these nice restaurants, haha! it's not you, that flash image does look like natural light! That little cake is adorable! Also, I adore your film-digital comparisons... fascinating. 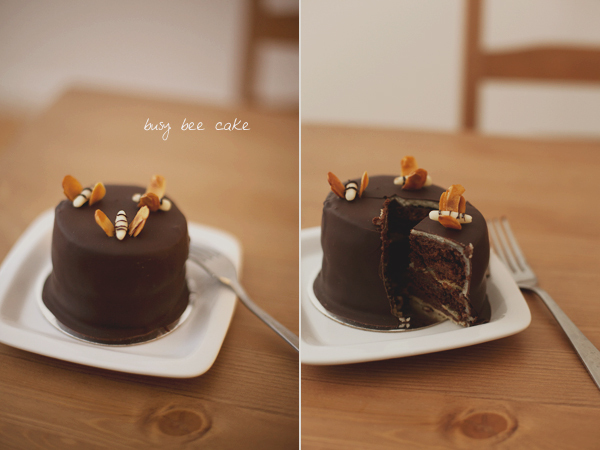 That little busy bee cake is so cute! Definitely could pass as natural light - in fact I thought it was before I read the caption! Great post!